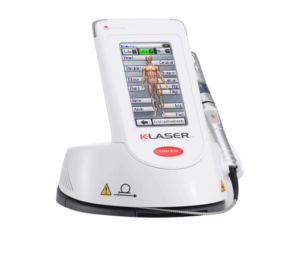 If you are suffering from chronic or acute pain, K-Laser therapy can help. This therapeutic technique consists of red and near-infrared laser light to speed up the body’s natural healing process. The K-Laser works by increasing the production of cellular energy across the cellular membrane. Despite its success, you will recover faster if you use it with physical therapy. With this in mind, you should make an appointment with a physical therapist who is certified in using this technology. For patients who suffer from chronic and at times, debilitating pain, your body may need help increasing its blood flow. Through radiation, the K-Laser is able to improve blood flow by changing the temperature gradient in your body. If you are still unsure that K-Laser can help, maybe Steve Donohue can convince you. In his fifth year as head athletic trainer for the New York Yankees, Steve has used K-Laser therapy for players who sustained acute and chronic injuries. If the K-Laser can help the Yankees deal with the rigors of playing professional baseball, imagine what it can do for you! Now that you’re ready to use K-Laser therapy to treat your unique condition, you need to pick a medical professional who can administer it to you. We recommend that you receive this type of treatment from a physical therapist. Physical therapy treatments such as manual and electrotherapy have been effective in working with the K-Laser to help you heal faster. If you live or work in the Massapequa area, come see us at Park Physical Therapy. Our physical therapists have received their certifications to use this technology. We are also familiar with a variety of other techniques that are effective in treating patients who have acute or chronic pain. For more information or to make an appointment, call us at (516) 798-3789. We look forward to working with you!